Water freezes at 32 degrees Fahrenheit. This makes for a refreshing summer beverage, but in the winter months, it can cause damage to hoses and pipes. As water freezes, it expands. Once it starts to expand, there is little that can stand up to the pressure it forces on fixtures. You must know where and how to access your water main. In the event of a frozen pipe or a burst pipe, you will want to know where you can shut off the water to your home. A single broken pipe is manageable, but a flooded home is going to be more difficult to tackle in freezing months. Keeping the heater going in the midst of the colder weather will help keep the pipes warm and flowing. Your best bet is to keep your home above 55 degrees Fahrenheit at all times. If you are finding cold spots, you may want to invest in a few smaller space heaters to keep the warmth on your critical components. Open cabinets to let warm air circulate around pipes. Kitchens and bathrooms that are on outer walls are more susceptible to the colder temperatures than other rooms. You will want a constant flow of heat to these spaces throughout the winter months, if not for your own comfort at the very least. If you have any pipes that run near the exterior walls, open a faucet that is serviced by them. Even a little drip will keep water flowing and help prevent freezing. You will only want to do this when it drops to below freezing, and turn off the drip when it warms back up. A slow, constant flow of water can damage seals over time, but it pales in comparison to the damage frozen pipes can do. Take care of any damaged plumbing now before the cold weather arrives. If you know of any leaks, tend to them now while you can because water can accumulate and freeze. As it does, it can expand and cause further damage. It may also be a good idea to insulate your attic to prevent heat from rising out of your roof. If you have a crawl space that is accessible, you can insulate it. Air can pass through and draw out heat. Otherwise, you might be left with more than just cold feet. Sprinkler systems will need to be flushed and drained before the winter months hit. Just follow the manufacturer's guidelines for cleaning the system before shutting it down for the year. The last thing you want to do is dig up your yard to replace broken sprinkler lines in the spring. 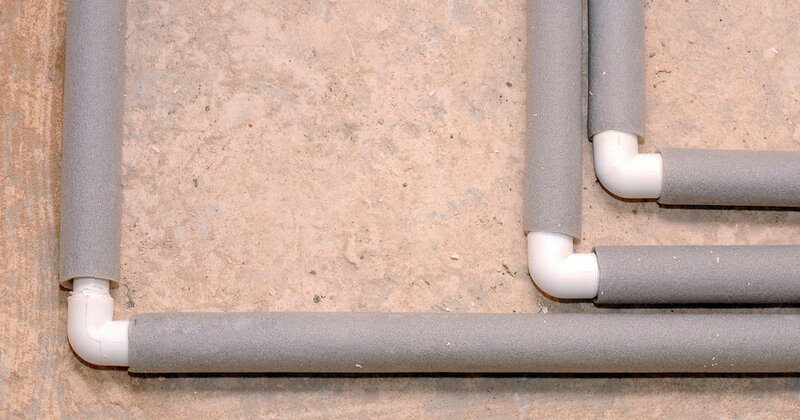 Drain and store any hoses that you have outside. Typically, draining them after using them is good practice to keep them from becoming homes for mold and mildew which can damage the hoses over time. Clear them out and pull them inside to keep the cold weather from making the material brittle and weak. For all of your exterior spigots, getting some foam faucet covers installed is an inexpensive investment that can save you time and money should the cold finally get to them. Cheap, and easy to install, these handy little additions will insulate them from the cold just fine. You may want to look at installing the covers over spigots that are rated for freezing weather, just in case. If you do need to keep a hose hooked up for any reason, using a heated hose is about your only option to keep the water flowing. Hoses that are manufactured with heating elements in them can be expensive for a short length. Upgrade kits aren't cheap either but may work for longer hose sections. Running a heating element down a hose and then wrapping it in pipe insulation is a great way to keep water moving outdoors during freezing weather. For more information on how to prepare for the winter months, you can call us at 405.895.6640. For other plumbing problems, you can download our FREE ebook on five plumbing problems you can fix right now.